Situational awareness: Even venture capitalists are beginning to sign on to so-called hipster antitrust: Alan Patricof is the latest to call for breaking up the tech giants. The Tianhong Yu’e Bao money market fund now has 588 million investors. Congestion pricing will officially arrive in New York in 2021. Next on the list: Los Angeles? Who are you? And can you prove that, in today's digital world? Identity is the biggest problem, and opportunity, facing just about every online service out there. The result is that for-profit corporations are increasingly making inroads into areas where governments can't or won't tread. Driving the news: Apple, this week, announced a slew of new services at a star-studded California event. Its shiny new AirPods and iPads and iMacs, by contrast, were revealed with almost no fanfare at all. One big difference: While gadgets are hardware that can be bought anonymously and given to anybody, services are inextricably tied, from the day they're bought, to a single identity. A new ecosystem is emerging. Apple ID encompasses biometric data (your face) and financial information (through Apple Card and other cards uploaded to your Apple wallet), and it powers all of Apple's services. Already you can simply tap your Apple Watch to travel on London's public transit. It's not inconceivable that your passport or green card could end up on there, allowing you to cross borders with a wave of your wrist. Wireless providers want to be part of this market, too. (Realistically, they already are.) 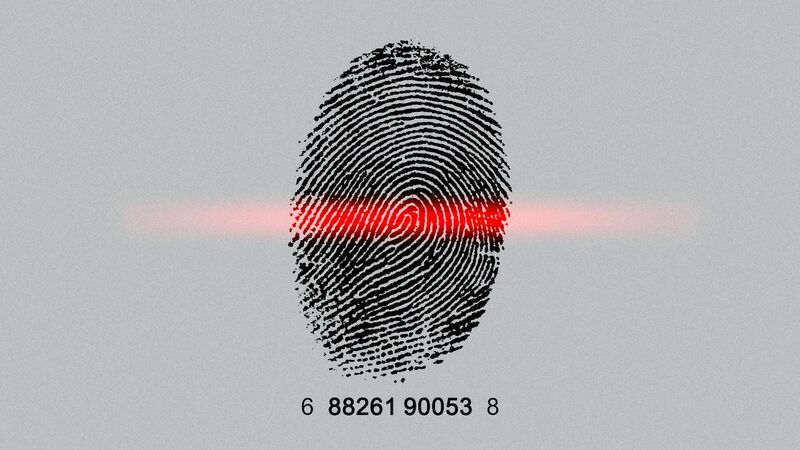 Who you are can be defined biometrically — you're the person with this face and those fingerprints — but it can also be defined geographically. You are the person located at a specific location at a specific time. The promise of 5G is that it will allow hyper-specific geolocation. If someone claiming to be me is trying to make a credit-card purchase at a specific cash register, my simple physical presence at that register, as verified by my cellphone provider, can effectively authenticate my identity. Mastercard aspires to be at the forefront of the privatization of identity. Its new white paper lays out an expansive vision: "A child born today will not have a bank card, hold a passport, or carry cash," it says. The paper puts forth some simple and sensible principles for how digital identity should be managed, starting with the idea that individuals, rather than corporations, should own their own data. We reveal too much personal information today. In order to enter a bar, for instance, we might need to prove that we're over 21. But doing so involves handing over a state-issued document that includes our name, photograph, exact date of birth and address — all in plaintext. The bar doorman does not need all that information, nor should we be obliged to give it to him. The existing information grid is limited, as anybody who has moved to a new country knows. Doing so all too often means effectively losing information about our creditworthiness, health records, professional qualifications and many other attributes. An internationally interoperable identity system could solve all those problems. The bottom line: Mastercard CEO Ajay Banga says that people don't want to participate in an identity system that's controlled by the government. Stories from China's dystopia, not to mention recent troubles at India's national Aadhaar identity service, might seem to reinforce his point. Still, there's something discomfiting about the prospect of multinational giants monetizing their identity-as-a-service platforms to the tune of billions of dollars per year. Go deeper: Axios' Kim Hart and Sara Fischer reveal just how many companies are already monetizing your identity. There are lots of reasons to be very worried about the markets and the economy, should you be so inclined. The yield curve inverted last week, which normally presages a recession. The economy is decelerating fast: GDP growth was 4.2% in the second quarter of 2018, 3.4% in the third quarter, and 2.2% in the fourth quarter. Economists expect it will register a mere 1.7% growth in the first quarter of 2019. The White House is calling for an immediate half-point cut in overnight interest rates, as Axios' Dion Rabouin first reported. That kind of sudden rate cut generally only happens in an economic emergency. The herd of unicorns rushing to go public is raising worries that the smart money is getting out at the top of the market. All of these concerns can easily be countered, if you're feeling bullish. As of Friday, the yield curve is no longer inverted; economic growth is expected to pick up again in the second quarter; the people calling for rate cuts say that there's no emergency; IPOs are a sign of optimism, not a reason for pessimism. The bottom line: The stock market loves nothing more than to climb a wall of worry, and it duly posted a spectacularly good first quarter. Bond investors were happy too, with the 10-year bond yield falling to levels not seen since 2017. That in turn created new optimism for mortgage origination. The macroeconomic concerns are real, but the bull market rages onward. Lyft raised $2.34 billion on Thursday in an IPO that was 20 times oversubscribed. In other words, the underwriters received about $47 billion of orders for Lyft shares — more than double the market capitalization of the entire company. The Levi Strauss IPO, last week, was 10 times oversubscribed. A raft of other IPOs could raise as much as $100 billion on U.S. markets alone this year. Uzbekistan's recent global bond offering was more than 5 times oversubscribed, and came on the heels of a similar bond from Tajikistan, which was 8 times oversubscribed. Where's the money coming from? In a word, buybacks. So far this year, U.S. companies have spent $253 billion buying back their own stock from investors. Most of those investors don't want to exit the stock market entirely, so they need to reinvest the proceeds elsewhere. IPOs are one of the few areas that companies are actually asking for new equity capital. Be smart: Underwriters have every incentive to exaggerate the amount of demand they receive for their offerings. And once a deal is oversubscribed, many investors will artificially inflate their orders, in the knowledge that their final allocation will end up being scaled back. Still, much of the demand is real — and is likely to remain elevated as long as American companies continue to flood investors with cash. Donald Trump made a fateful decision last month when he attempted to politicize the Fed board. By nominating Stephen Moore to the board — a Republican partisan rather than an economic technocrat — Trump turned the genteel if inefficient process of Fed nominations into something much more bare-knuckled. The Guardian went into full-on muckraking mode, finding first that the government has accused Moore of owing $75,000 in back taxes, and then that a judge ruled in 2012 that Moore had failed to pay more than $300,000 of spousal support and child support to his ex-wife. An epic Twitter thread from policy wonk Sam Bell has dug up Moore calling for rate hikes in August 2008, not to mention the abolition of the Fed and the reinstatement of the gold standard. Winners: Trump wins this round even if Moore's reputation is ruined and his nomination never reaches the Senate. We're watching a familiar Trump play — by going on the offensive and infuriating the sophisticates, Trump and his allies get to congratulate themselves on shaking up the system. Losers: Moore surely can't be enjoying seeing details from his divorce proceedings splashed across the press. But the biggest loser is the Fed itself, fighting daily to avoid being dragged into the swamp. Clive Thompson is out with a new book, "Coders," excerpted in Wired. In it, he talks about engineers' aesthetic of efficiency — how "coders’ eyes blaze when they talk about making something run faster," and how they dream of doing such things at previously unimaginable scale. The other side: Silicon Valley coders might love to make processes leanly efficient, but the irony is that Silicon Valley's billions come from inefficiencies. The efficient way to allow individuals and brands to market themselves on the internet is to create a site where they can do so for free — Craigslist, perhaps. Facebook built such a site — but then started ensuring that brands' posts would not be seen unless Facebook itself got paid. Apple could efficiently funnel its news-service revenue to the publishers who actually produce the content; instead, it's reportedly taking 50% of the money for itself. The efficient way to match drivers with passengers, or homeowners with short-term renters, is to create a real-time marketplace that people pay a small fee to access. The inefficient way is to go to great lengths to ensure that payment is routed through the platform, allowing companies like Uber or Airbnb to take an arbitrarily large slice of the transaction. The bottom line: Software has value, but it also has zero marginal cost. In an efficient world, the cost of software would trend toward zero. Instead, companies spend billions of dollars attempting to buy a dominant market position that then allows them to extract monopoly rents. Coders might love efficiency, but capitalism rewards rent seeking. Britain didn't exit the EU as scheduled on Friday; the country is now in its 2-week extension period, with no clear route to avoiding a hard No-Deal Brexit on April 12. The European Commission says that No Deal on April 12 "is now a likely scenario." The big picture: An overwhelming majority of both the public and the British Parliament considers No Deal to be the worst possible outcome. But given political realities, it's easy to see it happening. Britain has the ability to avoid No Deal — to hold European elections, negotiate a longer extension, or even to repeal the Brexit decision entirely. But it's far from clear that the governing Conservative Party has the willingness to go down any of those routes. The Financial Services Forum is going to have to update its membership page. The group, represented by the CEOs of America's 8 largest banks, has struggled with a distinct lack of diversity. This week, Wells Fargo CEO Tim Sloan stepped down, to be replaced by the bank's general counsel, Allen Parker. Parker is supposedly only an interim CEO — itself a sign of dreadful succession planning by Sloan. Still, the chances remain high that Wells Fargo (whose board is chaired by a woman) will ultimately settle on another middle-aged white guy as permanent CEO. Former Goldman COO Harvey Schwartz is reportedly talking to the board about the job. Expectations are that the economy added 170,000 jobs in March, while unemployment will likely hold at 3.8%. Wages are expected to rise 0.2%. Tesla will report first-quarter earnings. No word on which day, but the company releases these numbers two or three days after quarter end. Focus will be on the Model 3. Analysts think demand has subsided, in part thanks to a federal tax credit that was cut in half this year. The company has already dialed back expectations, blaming the amount of time it takes to deliver cars, including Model 3s, to China and Europe. China's Vice Premier Liu He will be in Washington on Wednesday for more trade negotiations. No deal is expected to be announced this week. For those keeping count, this week's negotiations are the 9th round of U.S.-China trade talks. 9. 1 theater thing: "The Lehman Trilogy"
If you're going to be in New York between now and April 20, "The Lehman Trilogy" has arrived in its spiritual home of New York for a short run. Directed by Sam Mendes and starring Simon Russell Beale, it has received rave reviews from the likes of the NYT and Hollywood Reporter. 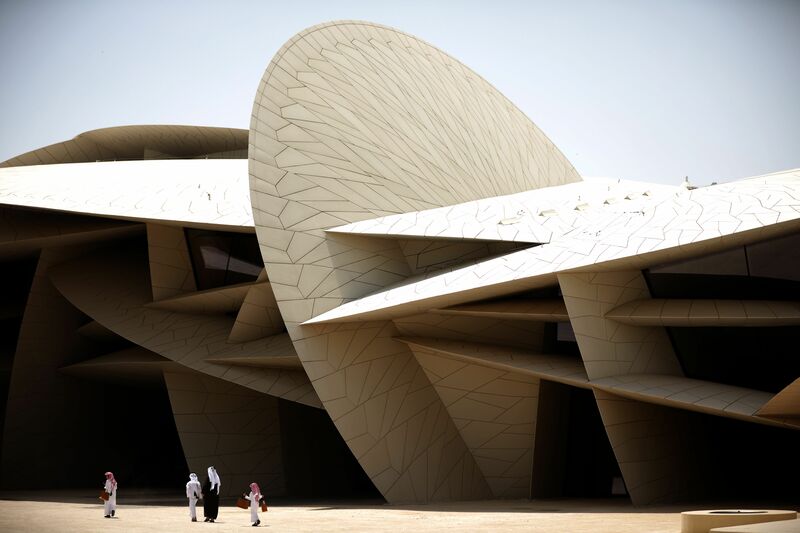 Jean Nouvel's National Museum of Qatar opened this week in Doha, its 539 patterned disks creating a structure modeled after a desert rose. The museum's 560,000 square feet incorporate an entire pre-existing palace, while its slanted walls are used for immersive video projections. "Aldeas Abandonadas, an estate agency specializing in such sales, last year sold about 40 villages, with foreign buyers accounting for 90 percent of the transactions. The company recently got a boost after Gwyneth Paltrow flagged one of its villages on her website as a good Christmas present." — Charlie Devereux, Bloomberg, "Ghost Villages Are for Sale in Spain"